A Rup Life was provided a sample of this DVD for review purposes. Giveaway is a sponsored giveaway. Post contains affiliate links! I'm so excited to bring this awesome giveaway to my readers! Mike the Knight is just about the cutest little knight! My 2 year old loves watching him on tv and has told us many times he would like the playsets (maybe Christmas!). Little Mike works hard to become a brave and strong Knight! 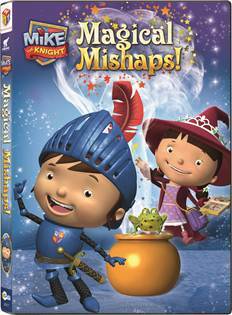 Mike the Knight: Magical Mishaps DVD is another one of his wonderful adventures! Mike the Knight airs daily on NickJr and takes the viewer on medieval adventures with the knightly Mike and his trusty horse Galahad, his sister Evie, their friend Trollee, and two friendly dragons, Sparkie and Squirt. Mike, whose motto is “Be a Knight and do it RIGHT!”, helps teach young fans about helping others, problem solving, working together, and chivalry. You can purchase your copy of Mike the Knight: Magical Mishaps at Toys”R”Us, Kmart, Target, and Amazon.com! Be sure to like NCircle Entertainment on Facebook for additional information!